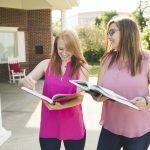 As an alumnae chapter, we want to equip you with the resources and tools you need to provide the best experience possible for our members. Phoenix is a great resource and we encourage you to contribute to it as your chapter has news, celebrations and information to share. It’s never too late for us to welcome members into our sisterhood. Alumnae initiation is a wonderful and thoughtful way for you to show someone how much you care for her. Initiate someone today for lasting friendships and experiences! Find and access the forms and guidelines needed to be a chapter in good standing.